While over 100 beagles went from test subjects to companion animals virtually overnight, it could not have happened without the teamwork of many organizations coming together to make it a reality. It was collaboration and cooperation that got Tutti Frutti to the organization where her new life can begin in earnest. Hudson Valley Humane Society heard about the Great Beagle Escape from Jamie Lyn Rubin, program manager for New York City at Best Friends, since they were Pup My Ride affiliates. Staff from Hudson Valley Humane immediately made arrangements to get to Pets Alive as quickly as possible to take as many dogs as they could handle. They were able to take four of these cuties back with them. 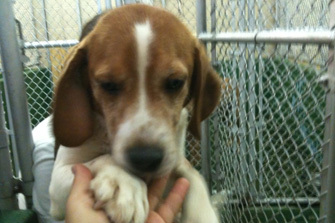 "Beagles are so sweet and I hope the public is receptive to adding one of these special dogs to their family. We really try to match the right family to the right dog at our facility - the animals always tell us who they want to go home with, and for the most part, they are right," shared Ann Marie Gaudio of Hudson Valley Humane. Ms. Gaudio was excited to have Hudson Valley Humane be a part of this heartfelt rescue. "Collaboration is the key to saving lives and this rescue was a great example of how working together can really make a difference. When we were contacted I knew that we were on the same wavelength with the rest of the organizations, that we"re all doing it for the right reasons. When you take part is a rescue of this nature it"s like a good shot in the arm. It can be addictive and you want to be a part of it!" Gaudio also shared that her first dog was a beagle and she knows that these dogs just make the greatest companion animals, or as she astutely put it, "if the whole world had the soul of a beagle it would be a much better place." Agreed! The volunteer-run Hudson Valley Humane has been operating as a no-kill sanctuary for thirty years. With their state-of-the-art boarding facility, low cost spay/neuter clinic and rigorous adoption program they are right where the rubber meets the road on the journey to no more homeless pets. They also use their conference facilities to train humane law enforcement officers on what to look for in animal abuse cases, in addition to offering similar training through their educational programs to the public. "We have experienced that awareness and education is critical to helping animals. Some people really don"t know what animal cruelty looks like. Not providing proper shelter is animal cruelty - we educate the public on what to look for and how they can be a part of the solution. We encourage people to take the right steps if something isn"t right with an animal in their neighborhood." They have also been working diligently within their community to give pet guardians the food they need to survive during these tough economic times. They had been getting calls about people needing support and giving up their pets as a result of their financial hardships. Hudson Valley Humane immediately sprang into action by implementing a pet food pantry. "Hearing about the need for pet food supplies we knew we had to do something. The pet food pantry is our way of helping keep companion animals out of the shelter system. People are having a hard enough time without having to fragment their family, their pets are their cherished family members and we want to be able to help keep them together." From the Great Beagle Escape to their pet food pantry, Hudson Valley Humane gives their all to the animals and the folks that love them! Read a story about a beagle rescued from a puppy mill.